Get started. No credit card required. Every account starts on our Free plan - No Credit card required. You can change plans at any time. Work management on the GO! Orangescrum's mobile apps have been thoughtfully designed for the modern day teams! They help you stay in touch with your team and customers alike i.e. At their own convenience & from the convenience of their smart devices. If you prefer to be invoiced. No Problem! please Contact us. YOUR convenience is OURS too! How is Orangescrum different from other tools or systems? Orangescrum combines work management + team collaboration & file sharing + invoicing + timelog, so that you can do more with the help of just one app. 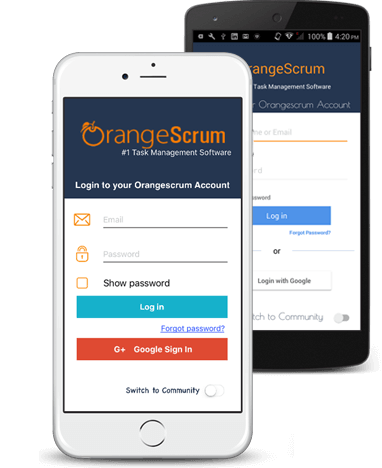 Orangescrum, to accelerate your business without the botheration of managing multiple apps. Check in the success story of SARAL using Orangescrum. Can I avail a free trial plan with all features? As soon as you sign up, you can enjoy Orangescrum's free trial for 30 days with all its features. When will I be charged for the paid plan? You will be charged at the beginning of the subscription date. All our plans are monthly chargeable plans. If you cancel your account at any time within the billing cycle, you will not be charged further and your subscription will be active till the end of the next billing date. You will still have all the access to all the functionalities you have with your current plan. You will not be charged from the next billing cycle and your subscription will be deactivated at the end of your current cycle date. Ex: If you choose your plan on Jan 1, then your next payment date is Jan 31. Can I opt for an Annual Orangescrum Cloud Subscription? Yes, you can! Orangescrum Cloud is available on an annual subscription plan in addition to monthly plan. I am not sure which plan best suits me! You can start with the plan that suits your needs today (say with respect to number of users) and upgrade to higher plan any time as required. You will be charged a pro-rated amount based on the remaining time in the current billing cycle. Ex: If you have 10 Users as of now then you can go for the "Startup" plan (10 users, Unlimited projects, 5 GB storage) and upgrade as per your requirement. Do you have any quick guide or getting started page? Yes, we do. It's known as "Orangescrum Helpdesk" - you will find all the answers to your questions with screenshots that will guide you in getting started with Orangescrum as well as rescue you if you're stuck somewhere. Can I downgrade or cancel? You can downgrade to a lower paid plan or cancel anytime. You can change it from "Account Settings". Click on your profile and navigate to "Account Settings" to select "Subscription". Choose "Change Plan" to change your current plan. What if I have a huge team and expecting unlimited activities? No problem, Contact us to avail customized pricing. Yes, the other mode of payment is wire transfer. This mode is accepted for both monthly and yearly subscriptions. Contact us for any help to know more. Can I get a Custom Plan which best suits my business? Yes, Contact us to get custom plan for your account. Is there any option to have Orangescrum on my premises? Of course, we can install Orangescrum in your environment with a customized price. Contact us for on-premises solutions. The security of your information is extremely important to us. We do not save any credit card number in our database, neither share your email ids to third parties. All the sensitive information are encrypted using secure socket layer technology (SSL). Do you need my credit card for a free trial? There is no need of any credit card during your free trial. Can I use multiple Orangescrum accounts? You can create only one Orangescrum account but if you are the owner of the account, it is possible to operate multiple companies. What about the refund policy? You are charged from your subscription start date till the end of 30-days of your subscription. If you cancel in between, your subscription would be still active till the next billing date. Ex: If you cancel your subscription on Jan 5 & your billing date was Jan 1, your account will active till Jan 31 and you will be charged for the month of January. Can I customize my Orangescrum? We do not accept any customization request for the cloud version. However, you can request us for a new feature. Note: Customization request is possible if you are using or interested for the Orangescrum Community or Enterprise (on-Premises) Version. *All free trial are cloud only. After you buy the self-hosted version, You'll easily move your data to server and continue where you left off. Self-Hosted Orangescrum is the same as in cloud - only you install it on your server. The self-hosted version gives you full control over your data. Check in the success story of companies using Orangescrum. As soon as you do the FREE Sign Up you can explore all Orangescrum features for 30 days absolutely FREE. No Credit Card required. Who is an Orangescrum User? What license do I get with the Self-Hosted software? You get a Perpetual License for any of the self-hosted plans chosen by you. What are the Self-Hosted Perpetual License benefits? 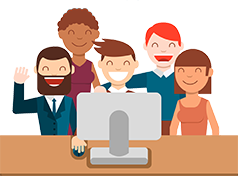 Orangescrum Self-Hosted Perpetual License grants you the right to perpetual use of the Orangescrum Software for the specified number of users based on your chosen plan. It also includes 12 months of maintenance and support (code upgrades if any) from the date of purchase. You can opt for renewal if you wish to continue to receive the maintenance and support from Orangescrum. Is the price for the self-hosted perpetual license a one-time payment? YES! You can use Orangescrum Self-Hosted for as long as you like without any additional fees. You can opt for renewal if you wish to continue to receive the maintenance and support from Orangescrum. We accept payments through all major credit card services (MasterCard, Visa, American Express, etc) as well as wire transfers. Contact us to know more about the wire transfers. There are no refunds for the Self –Hosted plans. please activate your account and start using Orangescrum right away. Contact Us and we'll activate it for you.